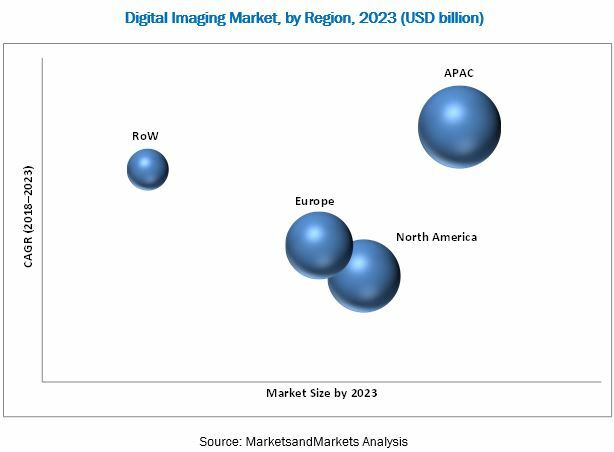 [166 Pages Report] The digital imaging market was valued at USD 14.33 billion in 2017 and is expected to reach USD 24.08 billion by 2023, at a CAGR of 8.81% during the forecast period. Factors driving the growth of the digital imaging market include technological advantage over traditional methods, growing need of industrial automation, and increasing consumer awareness raising the bar of safety and quality standards. To strategically profile key players in the digital imaging market and comprehensively analyze their market ranking and core competencies. In the complete market engineering process, both top-down and bottom-up approaches, along with several data triangulation methods, have been used to estimate and validate the size of the digital imaging market and other dependent submarkets. The key players in the market have been determined through primary and secondary research. This entire research methodology involves the study of the annual and financial reports of top market players and extensive interviews with industry experts such as CEOs, VPs, directors, and marketing executives for key insights (both qualitative and quantitative) into the digital imaging market. 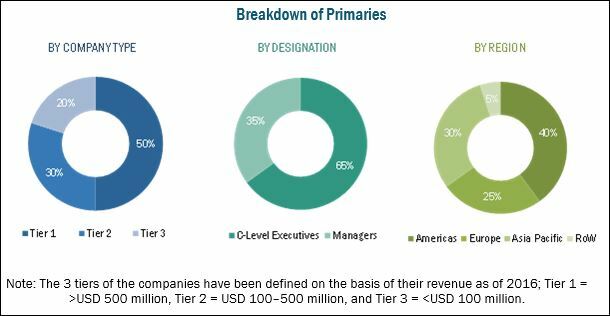 The digital imaging market ecosystem comprises players such as GE (US), Olympus (Japan), Hexagon (Sweden), Cognex (US), Nikon (Japan), OMRON (Japan), Ametek (US), Matrox (Canada), Teledyne Technologies (US), National Instruments (US), and Keyence (Japan). This study answers several questions for stakeholders, primarily which market segments to focus in the next 2–5 years (depending on the range of forecast period) for prioritizing their efforts and investments. Market Segmentation: The digital imaging market in this report has been segmented into the following segments. Company Profiles: Detailed analysis of the major companies present in the digital imaging market. The digital imaging market is expected to grow from USD 15.79 billion by 2018 to USD 24.08 billion by 2023, at a CAGR of 8.81% during the forecast period. Factors driving the growth of the digital imaging market include technological advantage over traditional methods, growing need of industrial automation, and increasing consumer awareness raising the bar of safety and quality standards. The inspection application is expected to hold the largest share of the digital imaging market by 2018. Inspection forms an important tool for quality control in the manufacturing industries, such as automotive, aerospace, machinery, and semiconductor fabrication. Quality control is an integral part of any production process as it allows these processes to run smoothly without incurring any extra cost. The automotive industry is also a major contributor to the digital imaging market, as it is focusing on high-value propositions, along with cost reductions. Digital imaging is required in process development phases, production processes, and qualification processes in the automotive industry. This industry is expected to hold the largest share of the digital imaging market by 2018, and the market for this segment is projected to grow at the highest CAGR during 2018–2023. The widening adoption of industry 4.0 for making the processes more efficient through timely flaw detection is driving the growth of the digital imaging market for the automotive manufacturing industry. Though in the long term, digital imaging and inspection provide an assured return on investment regarding the durability of complex machinery, the deployment cost of these systems is currently beyond limits for some of the industry minors due to their high costs. The average selling price (ASP) of some of the digital imaging system is in the range of few thousand dollars to hundreds of thousand dollars, which includes the R&D expense for the continuous advancements in the technology. The digital imaging market ecosystem includes major players such as GE (US), Cognex US), Olympus (US), Hexagon (Sweden), and Nikon (Japan). GE is the leader in the digital imaging market. GE provides innovative technologies including sensor-based measurement solutions, advanced software, asset condition monitoring systems, controls, inspection technologies, and radiation measurement solutions for the industrial and commercial applications as well as for the military and aerospace sector. GE is one of the globally leading brands and has a wide geographic reach on the back of various distribution networks, which helps it capture a significant market share worldwide. The company is applying digital capabilities not only to its own business but also to its customers. For the digital imaging market, the company provides a full suite of NDT solutions and equipment, including radiography, CT, remote visual inspection, ultrasound, eddy current, and hardness testing products. It has been mainly adopting the organic growth strategy of product launches and expansions to grow in this market. For instance, in March 2017, GE Oil & Gas launched the TransPort PT900 Portable Ultrasonic Flow Meter, a clamp-on meter for liquid flow measurement. It has an app-driven user interface on an Android tablet.